Able Office Moving is a full service commercial moving and storage company, experienced in office moves for a wide range of industries, including corporate office space, libraries and museums, aviation, medical facilities, restaurants and more. Every move, no matter the size or industry, requires detail, care, and organization. Our fully trained professionals specialize in: local office moves, long distance office moving, systems furniture disassembly, moving and assembly, IT disconnect & reconnect services, inventory and asset management, space planning, project management, warehousing, and more. Able Office Moving specializes in servicing your Northern VA office, company, organization, library, warehouse, data center, school, or hospital regardless of how large or small the project. Performing office moves in Washington DC for over 30 years, Able Office Moving has the experience, knowledge, and skills to support any move you have, at any time, in any location nationwide. Able’s Office Movers are all full-time, fully trained, certified, professional employees. Extensive background checks, pre-employment and random drug testing, and behavioral assessment testing are all requirements for Able employment. Each office mover is uniformed, badged, and has gone through extensive training to learn how to pack and transport your belongings. Our employees are capable, trained, accommodating, and work hard to make sure your move is handled as efficiently and effectively as possible. Able Office Moving has identified an opportunity for businesses to reuse gently used furniture and other items instead of throwing them away, thus decreasing the impact on landfills. Able also works with several area charities to increase opportunities for clients to work through 501(c)(3)s, simplifying the process of donating instead of discarding. Not only does this minimize the expense and potential risks for our clients, but it also reduces negative impacts on area landfills, and increases opportunities for charities and their beneficiaries. Some of the non-profits we work with are House of Mercy, Habitat for Humanity, Catholic Charities, Second Story (formerly Alternative House), and others. Able Moving has storage solutions for temporary storage of your office furniture and workstations, a remote facility to handle “last-mile” logistics, a long term storage & inventory system for your firm. With over 4 warehouses and more than 200,000 square feet of state of the art warehouse space in the Washington, DC metropolitan area, Able can customize a solution for you. By providing a single-source solution for all relocation and transportation needs, Able Office Moving offers the client a single point of accountability, allowing industry experts to manage a proven system for seamless transitions. Able Moving & Storage is a highly respected and well managed moving and storage firm located in Northern Virginia. 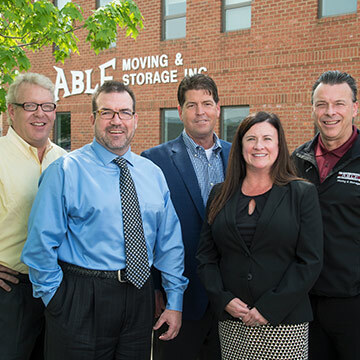 Founded in 1987, Able Moving & Storage is a family owned company, and one of the largest independent moving companies in the Washington Metropolitan Area. Today Able employs over 200 office and field personnel; performs thousands of relocations per year using over 50 company-owned, well-equipped, air-ride moving vans and additional trucks; and manages and operates over 200,000 square feet of modern warehouses, administration, and operations facilities in Northern Virginia. Able Moving & Storage’s headquarters is located on over 15 acres of secured property in Northern Virginia. The facilities, along with the administrative, operations, service preparation, storage, and dispatch areas, are built to modern specifications. Able Office Moving’s service is performed from a “partner” perspective, not a “vendor” perspective: The client’s best interest is the number one priority! Once you, our client, determine the level and quantity of support services needed, we custom build a solution. Relocation Planning and Management, Office and/or Systems Furniture Planning and Management, Structured Design and Construction Management and other transition tasks are all included in the range of service available. However, when special requirements arise, Able can find the ideal solution for your situation, no matter how challenging the request or circumstances. Focusing on your specific project requirements ensures professional, knowledgeable service uniquely tailored to the scope of your project. The individual and collective skills of our team members, combined with our unparalleled experience on the “front line” with thousands of satisfied clients for over 30 years, guarantees you have the best team in the business!